There’s sure to be a fire. In this case, long trails of ants paint a smoky trail to the real hot menace: aphids. By themselves, ants don’t pose all that much of a threat. Sadly, this rarely means one can rest easy. Nature, the wonderful beast that she is, always has a plan. You see, ants like to feed on the sweet stuff (honeydew) that aphids excrete — which means the army ants protect the aphids from natural predators. Which means lots of aphids. 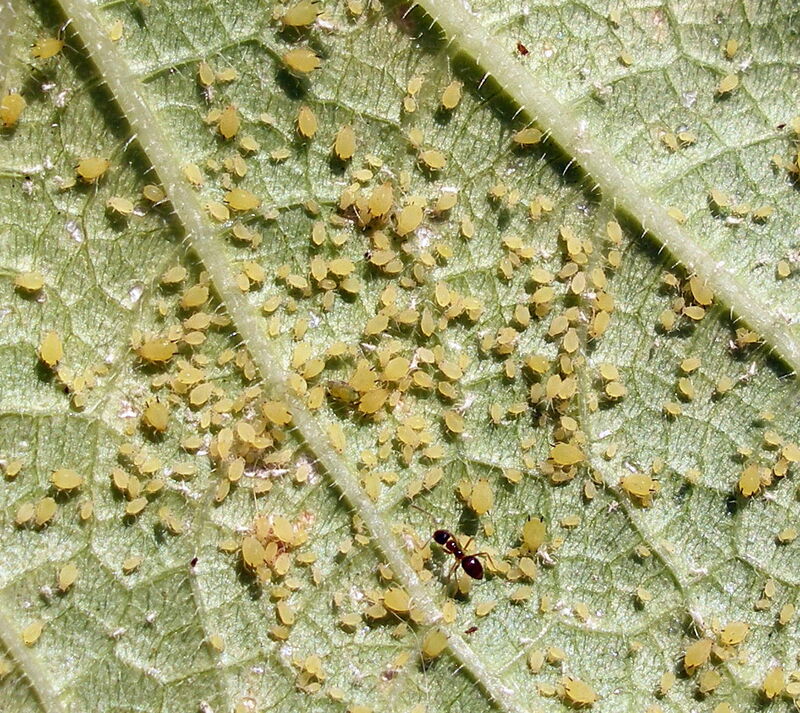 Lots of aphids means that great quantities of sap is slurped from leaves, leaving them curled, dessicated, and unhappy. As if that isn’t enough, aphids may also contribute to the spread of cucumber mosaic virus. Hi, I'm an aphid. Click on my picture. It's worth it to see my antennae and cornicles. So, yeah, it’s important to get rid of the sap suckers. The best method for removing aphids (supposedly) involves spraying the leaves with a steady stream of water to wash the aphids and honeydew from the leaves. Unfortunately, the little blue deck isn’t reachable by hose. Ladybugs love to eat aphids, but you could count the ladybugs this urban garden sees on your fingers. So what’s a container gardener to do? These buggers, which may produce up to twelve off-spring per day, are tenacious. So, try fighting fire with fire. Next year, try planting chives, basil, mint, or marigolds alongside the cucubmers and melons to discourage infestation in the first place.